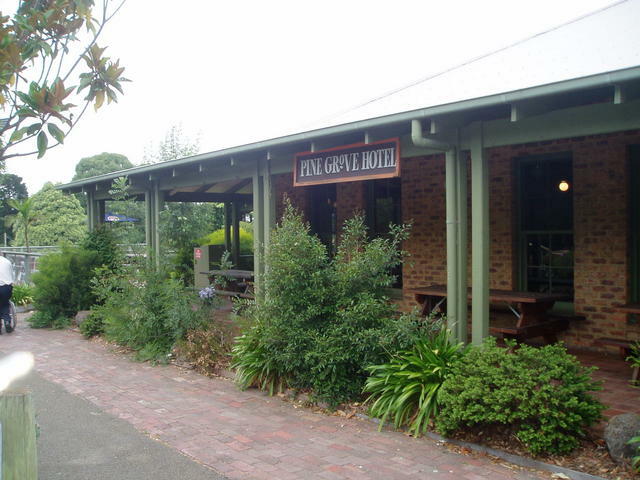 Silvan Dam Pub Trail linking Yarra Valley to Gippsland area. Mt Dandenong lies 40kms dead east of Melbourne, and is almost the tail end of the Great Dividing Range, standing at 2066ft. This range separates the South Gippsland area (towards Bass Straight) from the Yarra Valley (winery area). 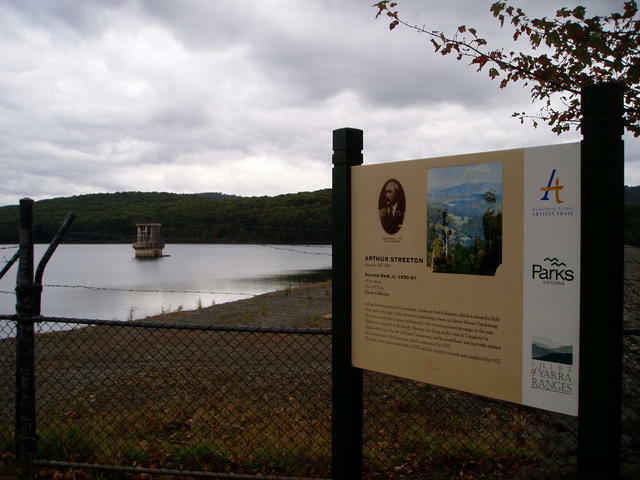 Silvan Dam lies on the eastern slope of Mt Dandenong, and its road access forms a beaut link south from Berwick (on the Prince's Highway) to Lilydale, going north, which is the entracnce to three major tourist routes to the north-east. 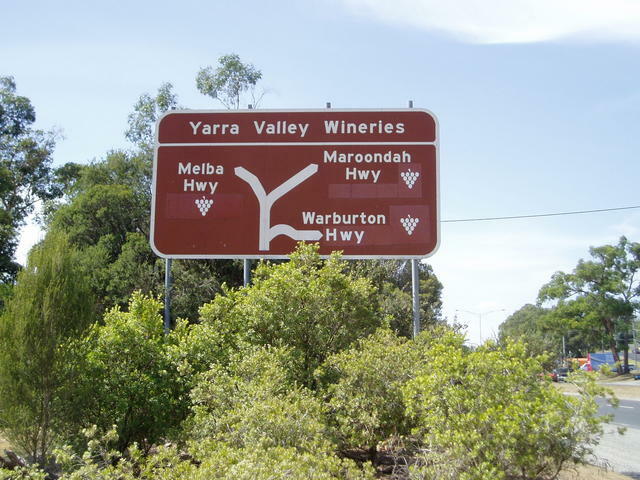 Visitors to Victoria travelling towards the capital, Melbourne, coming down the NSW coastline and along Prince's Highway, or even further south, along the Bass Highway or South Gippsland Highway eventually pass close to Berwick. 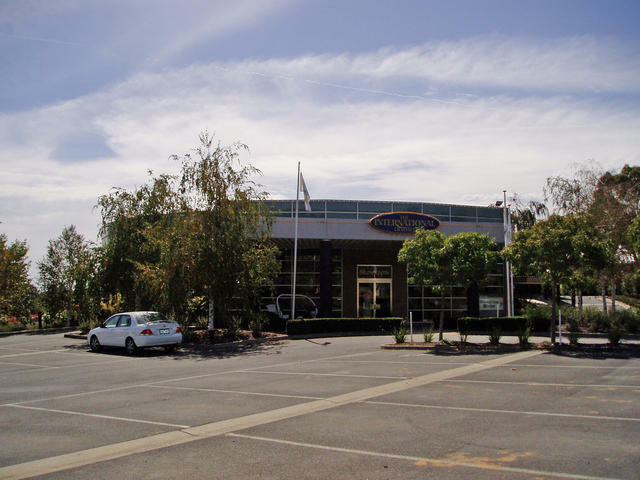 Travelling any further towards Melbourne, you meet the conjestion of the suburbs and busy freeways - but that can be avoided if you reeally want to explore the eastern regions before travelling to the western side of Melbourne. Similarly, travellers approaching Melbourne from the North West, say down the Hume Highway from Albury/Wodonga, or down from Shepparton through Seymour, can also consider coming into Lilydale via Yea and Yarra Glen. 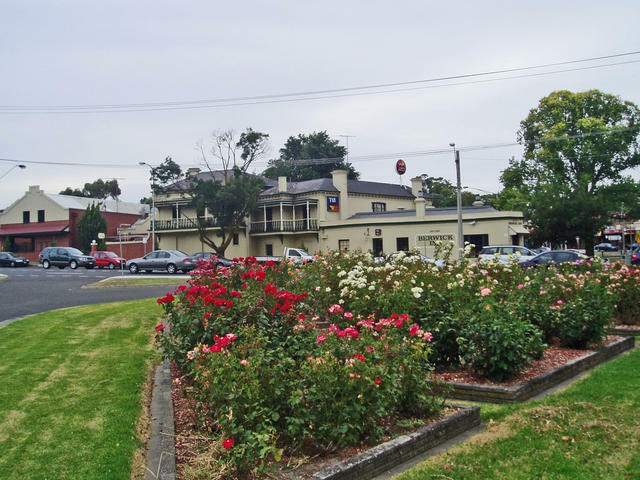 Again, Lilydale which lies on the edge of the main surburban outskirts of Melbourne, is a great base for exploring the North-East and eastern areas: wineries, bush, the entrance to the High Country beyond. Silvan Dam happens to fall in the middle of this bypass along the backside of Mt Dandenong, and following this itnerary you will get to see about 30% of what the Mt Dandenong area has to offer. 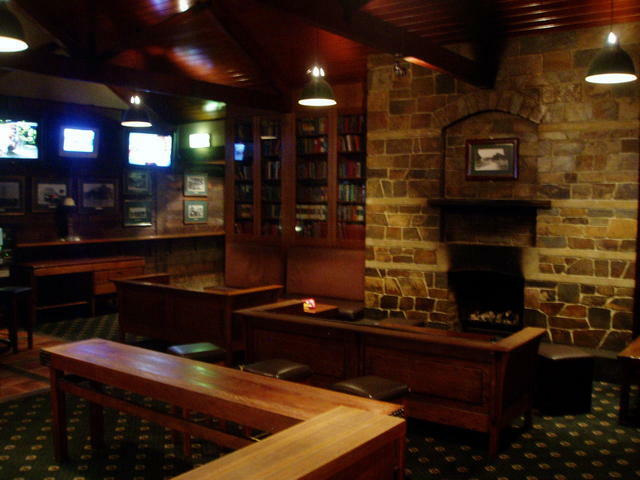 Refer to our adjoining Pub Trail called: "The Dandenongs" which links in with the "Silvan Dam" trail outlined here. Combined, we have set out two routes that let you see the entire region of the mountain. I will admit that this area has significance for me personally, as it is an area I have lived in all my life, and I've spent many a time helping newcomers to the area, enjoy what is on offer - and I am confident that readers too will find this particular link, useful for establishing a great resting place for touring nearby attractions - and some mighty fine pubs in the area! Berwick. Southern entrance to the the Silvan Dam bypass. 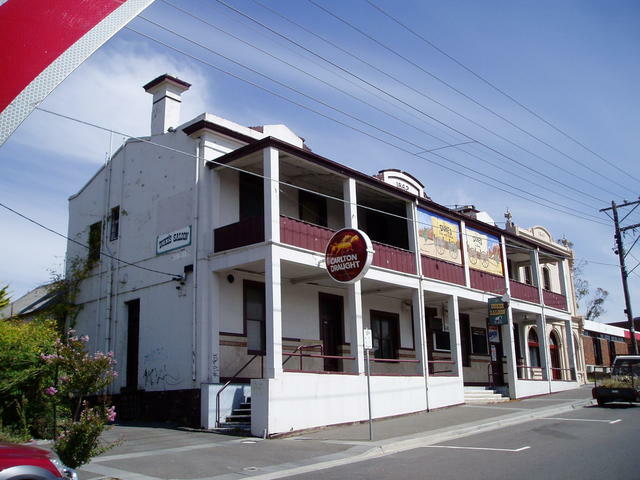 The original Prince's Highway travels right through the busy town of Berwick, and on the corner of Clyde St at the bottom of the hill in the town, is the Berwick Inn. There is plenty of on-street parking on the North-West corner if you are 'vaning. 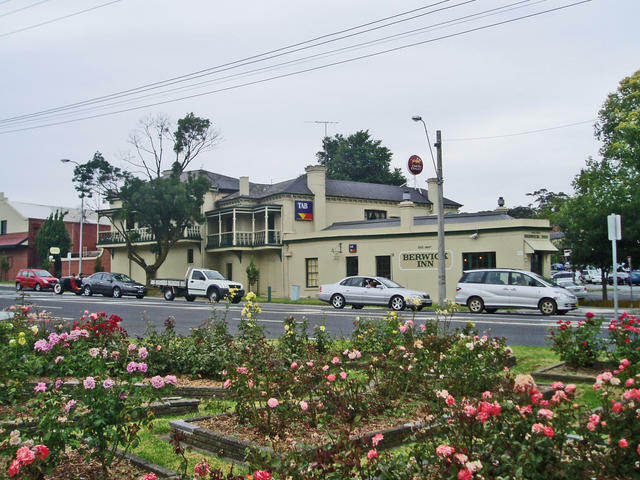 Stop and smell the roses, stretch your legs in the town, and get ready for the trip via Silvan Dam to Lilydale from here. If travelling on the Prince's Freeway, take the Clyde St exit north to the middle of Berwick. A real popular spot in the bush for the locals! On the corner of Prince's Hwy where you turn left (north) up towards Upper Beaconsfield towards Emerald. Top venue for functions - overlooking winery. The next stage is a bit windy, and the road changes name many times - but stay with the main bitumen and follow the trail notes below. You're skirting around the southern reaches of Cardinia Dam which is a major water supply for the Melbourne Metropolitan area. After you've turned into Wellington Rd and start heading to Clematis (follow the signs to Emerald which is after Clematis), you'll start to see part of the wall structure of the dam on your right. The dam wall can be inspected by taking the entrance on the right of the highway. After checking these out, push onto Clematis where Wellington Rd comes to its end. 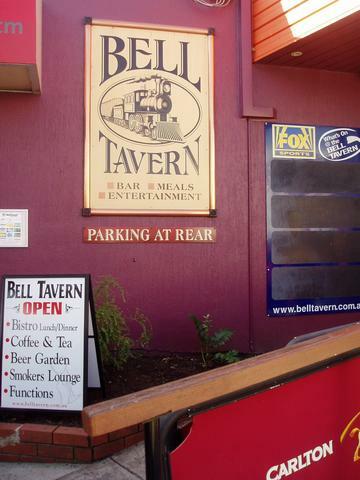 The next pub is on the corner! 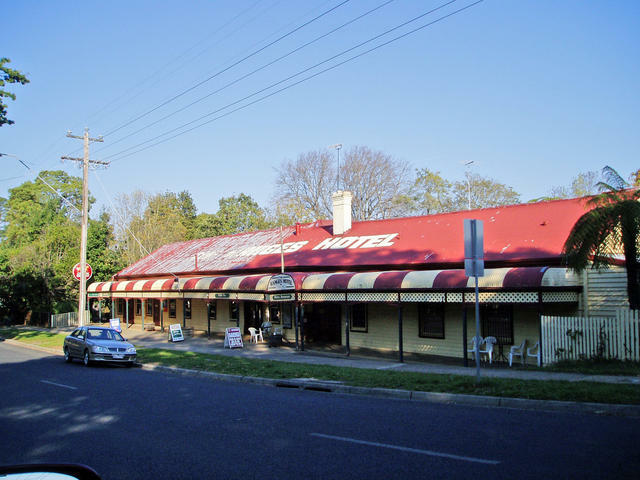 If you're lucky enough to spot it, the Puffing Billy steam train passes right through the backyard of this pub - so its a top balcony spot for an ale and seeing the train chuff through the adjacent hills, as it winds its way from Emerald Lake down to Belgrave. 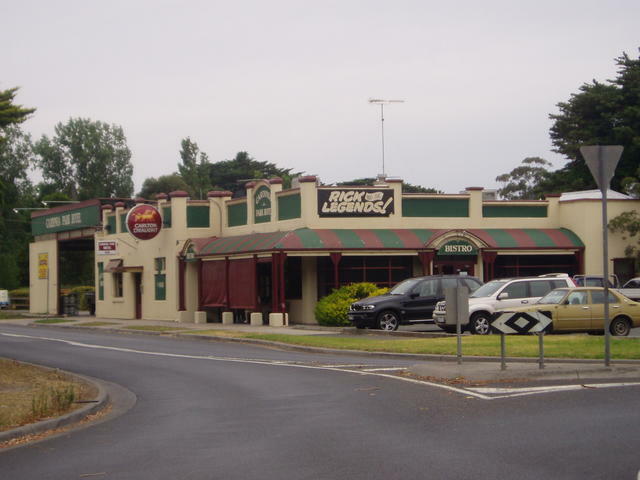 Just while you're in this area, this is a good opportunity to consider a sideline trip east through Emerald to Gembrook and back to Clematis, to keep back on track to Belgrave on this Pub Trail. Puffing Billy runs all the way through to Gembrook, and it is a treat to follow the rail line to Emerald, stroll the town and the rail station there. 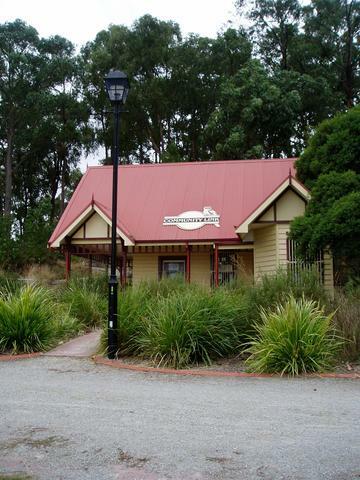 Then head on down to the end of the train line at Gembrook. The Motorist - museum and antiques. And for motoring enthusiasts, Gembrook has an interesting Motor Museum and antiques display including refreshments in the middle of the town (open Wed-Sun 11-4, and other times in summer seasons). A lot of local information about the town is available on the town's website. 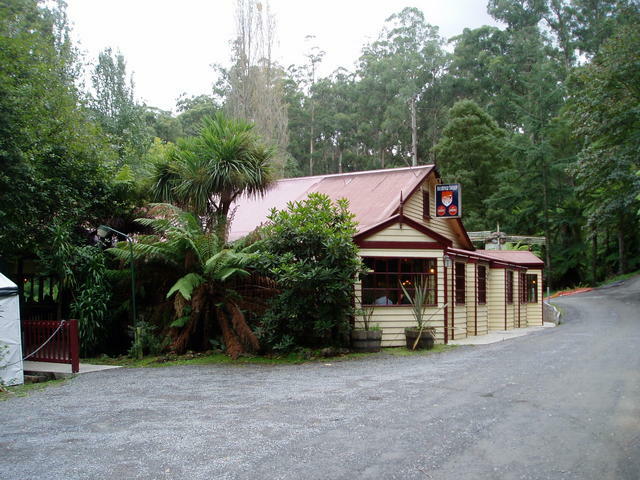 So take run into Gembrook, and park at the station there - or even consider a run down and back using the Puffing Billy steam train. Partial trips are possible. 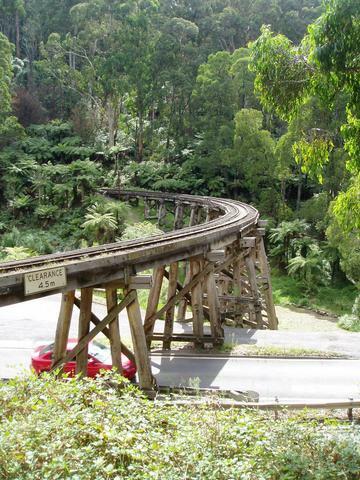 Travelling down towards Belgrave, you will follow and sometimes cross the narrow guage railway track of Puffing Billy steam train - an iconic tourist attraction of Melbourne. Passing through Selby you come to the Fire Station on the left, and if you are just in a car, it is possible to drive down to the end of Greenwell Rd to get a great view of the historic Trestle bridge. U-turn and return to Belgrave-Gembrook rd to continue into Belgrave. 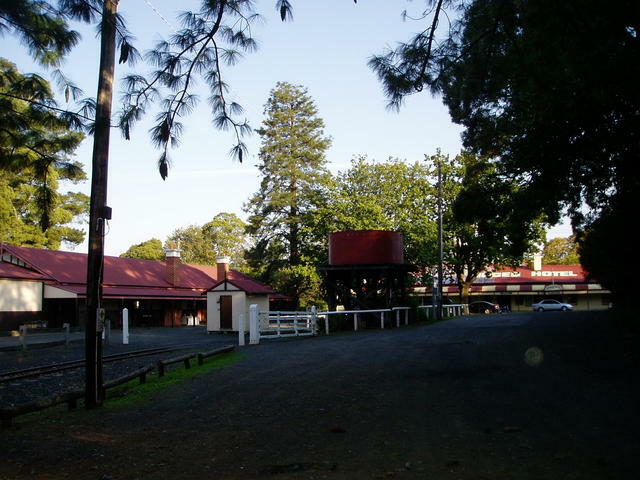 Puffing Billy runs from Belgrave through Selby, Menzies Creek, Clematis to Emerald Lake beyond Emerald township. 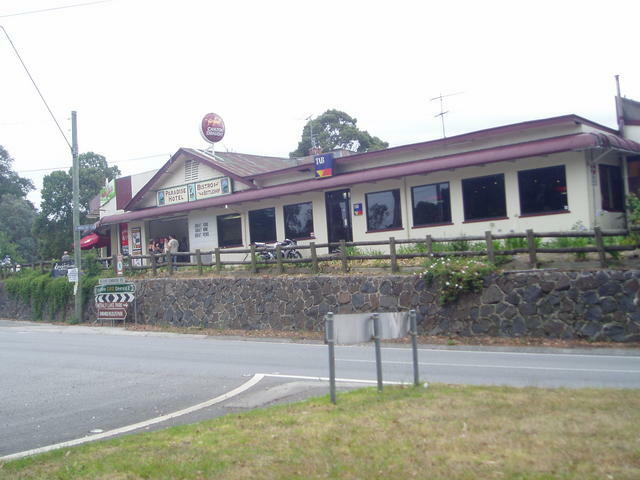 The extended ride takes travellers further east to Gembrook. Belgrave station is the end of the electric train line out of Melbourne, and adjacent, is the Puffing Billy rail station. Take a stroll through the town, enjoy a meal at the local cafes or pubs. The town also boasts a unique outdoor picture theatre at the Cameo Theatre at the western end of the town. Belgrave is a very tight thin set of streets through the town - not recommended for long towed vehicles. There is not very much parking around for car/trailer combinations. Once you reach the roundabout at the top of the town just past the bridge that has the two rail stations either side, you are pretty much committed to turning right and heading way out of town with few places to turn until you get 4kms up the road to Kallista. Turning left through the town also takes you way down Burwood Rd. There's no real 'round-the-block' scenario you can do. The main railway carpark may have a couple of drive through spots way up the back, but don't count on it. No worries if you are just travelling without a trailer. Head out of Belgrave to the eastern end where you first arrived from Clematis. But now push on up the road to the north-east up Monbulk Rd towards Monbulk, via Kallista. On the way, you'll wind around for 1-2kms towards the start of Sherbrooke Forest, and pass some craft/art shops you may want to visit. 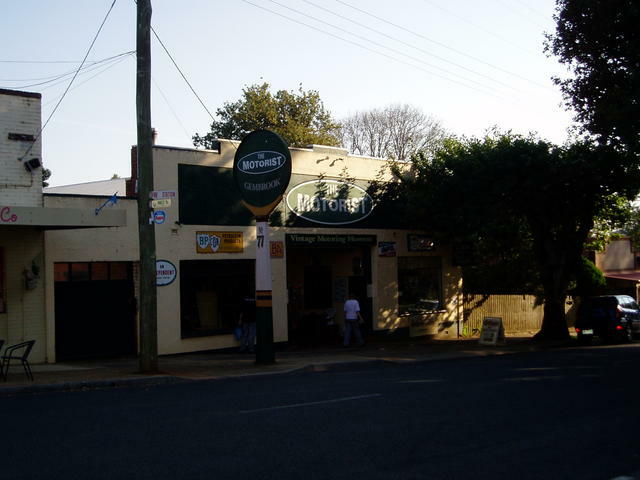 As you sweep around the last bend before reaching Sherbrooke Forest, keep an eye out for the Micawber Tavern on your left which has a brilliant bar atmosphere. The roundabout at the entrance to Kallista, is a point where our two local Pub Trails cross. At this roundabout, you cross the road that comes up from The Patch on your right, and goes left up to Sherbrooke. Refer to "The Dandenongs" Pub Trail that takes you up and over Mt Dandenong, which compliments this Silvan Dam trail. We recommend that both trails be considered separately to cover the entire region, but Kallista is the mid-point that lets you consider a figure-8 journey taking in aspects of both our trails if you prefer. So, if you're pushing on to Monbulk (per this Silvan Trail), then either proceed straight through the roundabout through Kallista township and down to Monbulk. Or, after you check out the small village of Kallista, we'd recommend you consider a small deviation between here and Monbulk, by turning right at this initial roundabout and going down via The Patch. Belgrave township looking west from the roundabout at the top of town. Railway to Melbourne is left over the bridge (and then a right), and Puffing Billy rail station is further to the left over the same bridge. Right in the middle of Belgrave township on the high side on the bend. 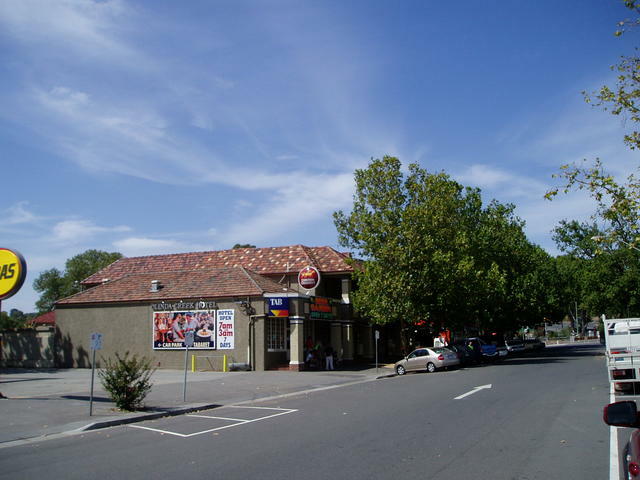 Via Road: Kallista-Emerald Rd, straight on at "Cook's Corner cafe", past the majestic views until you turn left into The Patch Rd (past general store), bear right at O'Connors Rd, cross Camms Rd, straight into Masches Rd (name change), and merge back onto Monbulk Rd (see pic). Gaz's spot: Chestnut sales from private sellers in Camm's Rd. Entering Monbulk coming down from Kallista, you reach a roundabout just short of the western end of the town. 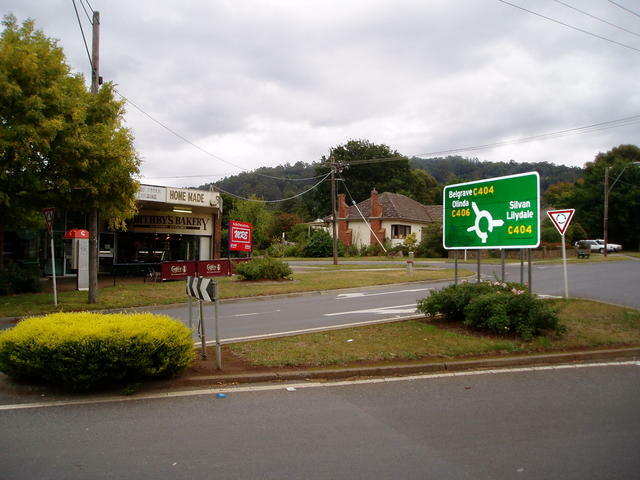 You will be turning left at this roundabout to head out towards Mt Evelyn passing the Silvan Dam on your left as you go. But first, drop in for a stroll, coffee or nibble in the town, and come back to this roundabout. 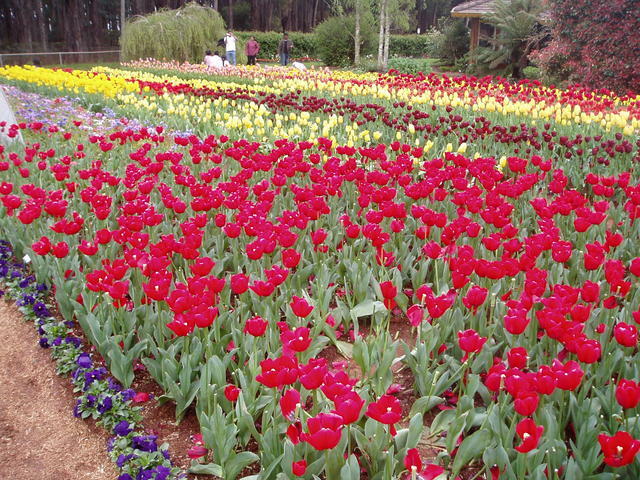 This area is renowned for its roses, tulips, berries, potatoes and a variety of other horticultural and farming produce. Keep an eye out for Tesselaar's Tulip farm along this route not far from the midpoint of the Silvan Dam that has an entrance on the left. Take a spin down to the dam, where there is an abundance of BBQ and picnic facilities, and inspect this picturesque dam. Gaz's spot: The great rose nurseries and fruit/vege stalls along the route. Return from the Dam, back onto the same road for pushing on towards Mt Evelyn and Lilydale. 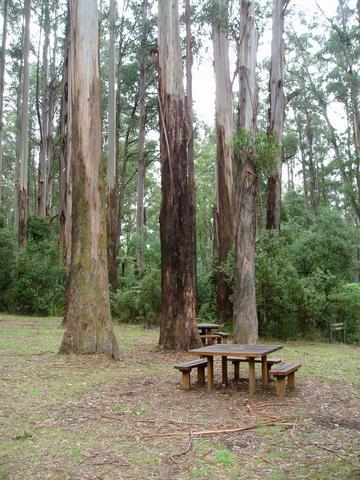 Picnic area in Grant's Reserve, on the right side of Monbulk Rd, just before reaching the township of Kallista. Great spot to feed birds, have a picnic, or walk to the Sherbrooke Falls. Silvan Dam wall, showing 45m concrete tower - built in 1926-1928. Travel into Mt Evelyn which has a huge roundabout at the top of the town, where you turn left into York Rd to decend down the side of the mountain down to Swansea Rd. 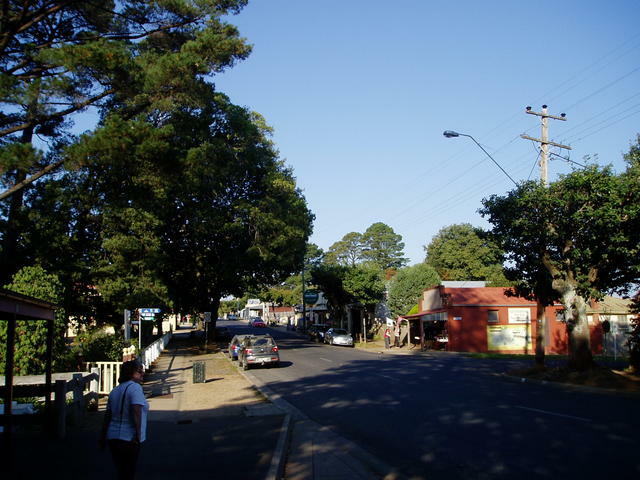 As you pass down York Rd through the town, you will see parts of the Warburton Rail Trail (now a walking track). More about this rail (walking) trail is mentioned in our Warburton Pub Trail which runs out east not far from the Mt Evelyn township - which we suggest is taken from Lilydale. So you'll pickup some of the attractions that are nearby Mt Evelyn, by referring to that separate trail. But we would make mention of Mont De Lancey which can be reached from Mt Evelyn by slipping down Clegg Rd which was at the set of lights about 1km before you reached the roundabout at the top of Mt Evelyn. See the Warburton Trail for more details. 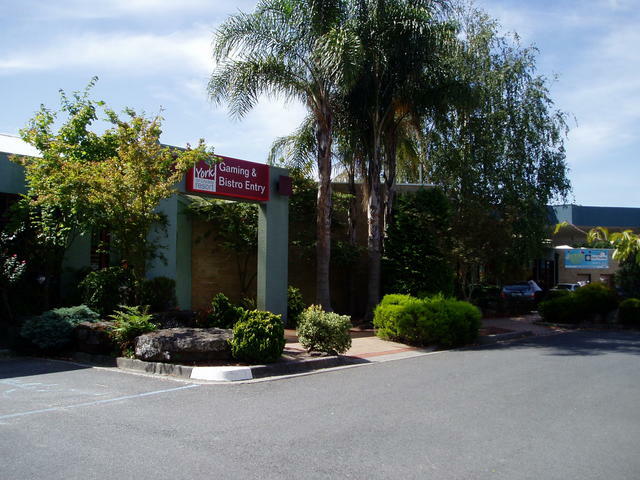 Push on winding down the steep decent along York Rd till you arrive at the York on Lilydale international hotel complex at the end of York Rd. Via Road: Monbulk Rd, left into York Rd at the top of Mt Evelyn. Proceed to the western end of York Rd to the end, at Swansea Rd. 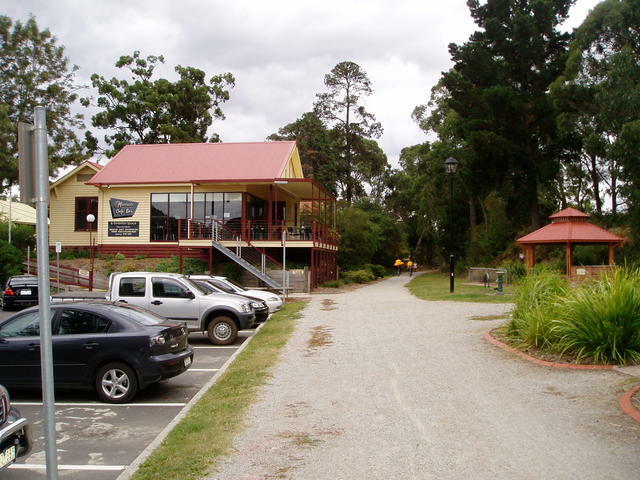 Attractions: Warburton (Rail) Trail - walking trail. Accommodation: Yes: 40 Spas. resort. 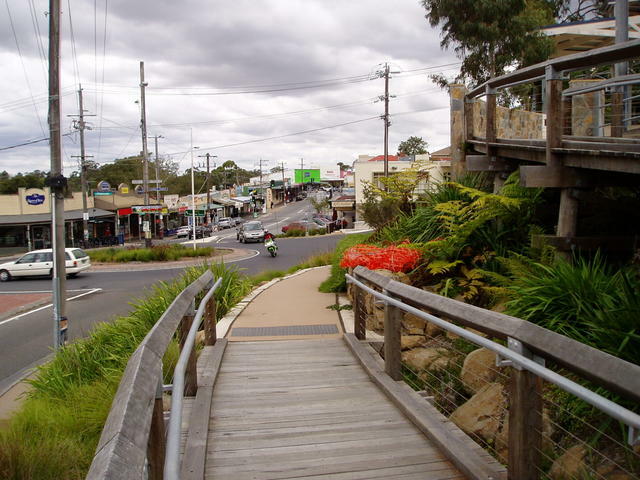 Gaz's spot: exploring the steep section of the Warburton (Rail) trail and interesting shops adjacent the roundabout at the top of Mt Evelyn township. 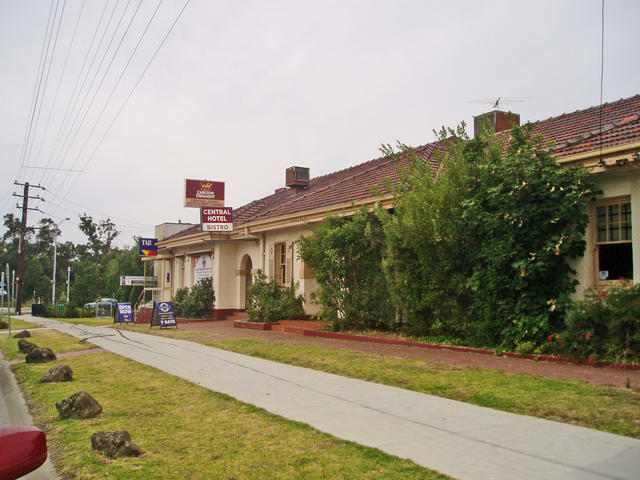 You'll head north along Swansea Rd to reach Lilydale, but stop off at the York on Lilydale to check out its many function rooms and facilities. At the foot of York Rd, 2-3 kms down from Mt Evelyn, and on the corner of Swansea Rd which leads you into Lilydale township about 4kms north. Well, you've reached the destination of this trail: Lilydale. 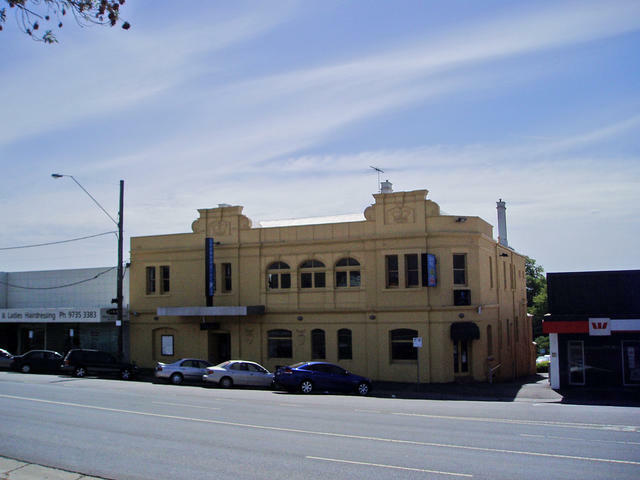 Refer to the Warburton Pub Trail for details of the pubs in Lilydale. Ah! This region has just so much to offer.... You'll need a few more days, that's for sure. 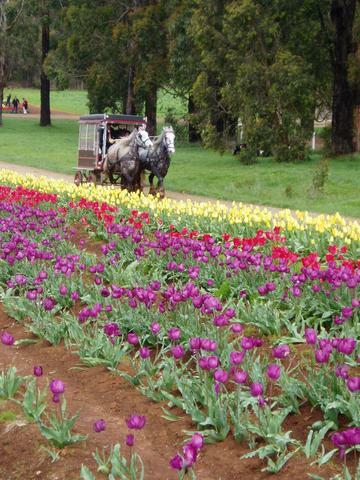 Tesselaar's Tulip Farm during the annual festival around September each year. 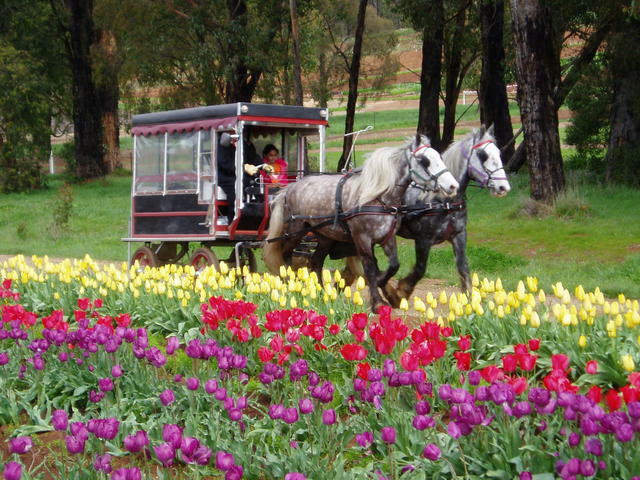 Enjoying a horse and cart tour of Tesselaar's Tulip Farm.